Inviting modern simplicity into your home will be well worth it, with the incredible Tokio Teak Dining Chair. A tremendous compilation of A-Grade Teak and new, exciting Sunbrella® rope in muted green… we just love the Tokio Teak Dining Chair! W21" x D22" x H30"
A-Grade Teak has become our signature product at Teak Warehouse, because we have been selling luxury furniture made out of it for over 20 years! 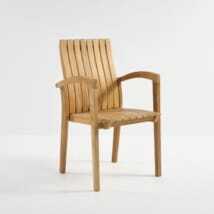 Time and time again it proves it is the ultimate choice for wooden material for outdoor furniture. 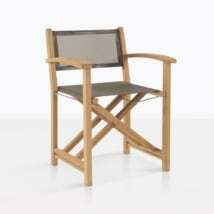 The grade ‘A’ is given tot he premium part of the timber, which holds the best quality teak wood. We only use tress that are harvested when the teak tree has aged to around 40 years, by which time the tree has generated natural quantities of natural rubber and oil content, making it the perfect strength for withstanding harsh weather conditions. 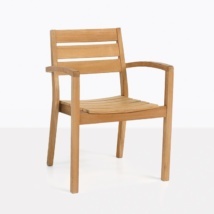 A-Grade Teak is beautiful whether you let it weather naturally or prefer to seal or oil it to keep it the honey color. And maintenance is a cinch! Simply wash it down a few times a year to keep it looking in prime condition. Visit the product care information on our website to find out exactly what products work best for this chair and many of our other products! With Sunbrella® there is no question that it is the best fabric for outdoor use, developed to be strong and resolute while being attractive and perfect for use on outdoor furniture. We don’t use anything else on our cushions because we know it is best! 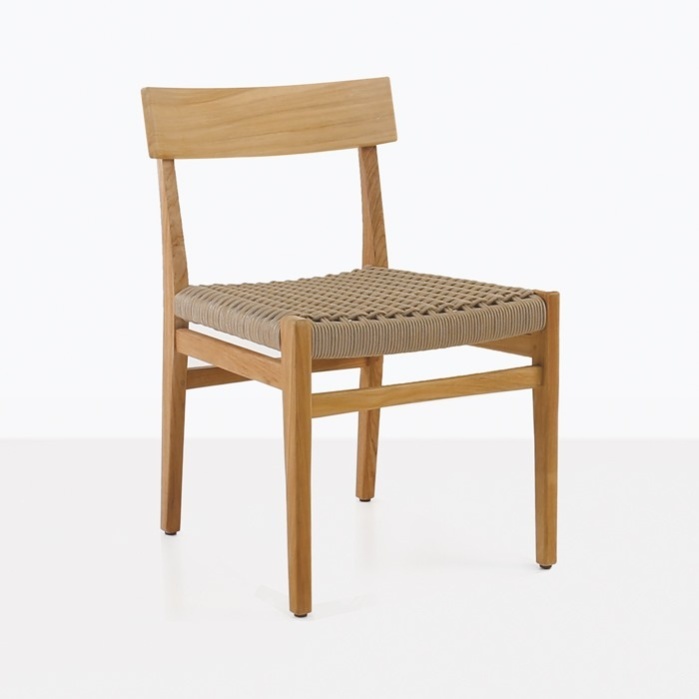 We had to jump at the chance to use this fabulous new range of rope products they have developed in the most excellent Tokio Teak Dining Chair. Along with splendid Sunbrella® and awesome A-Grade Teak, Teak Warehouse also carries Raw Concrete, Reclaimed Teak, Textilene® and Batyline® mesh, Resin, and #316 Stainless Steel. So whether your space is needing a deep seating unit, dining set up, relaxing chairs, sun loungers or simply some planters – we have everything you need to create the most exciting outdoor living space! 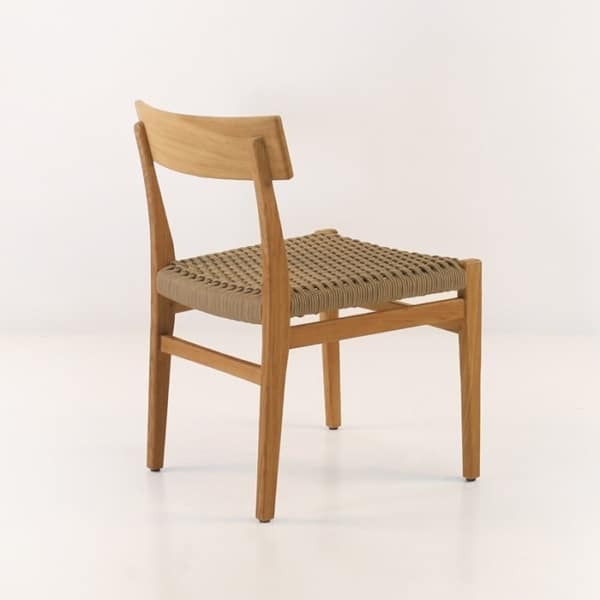 Our gorgeous Tokio Teak Dining Chair looks incredible around one of our A-Grade Teak East Coast style Dining Tables, pick something long and lean to be framed by these exquisite dining chairs. Place one of the Raw Concrete plates or bowls in the centre filled with candles and watch how people gravitate to your space! Do you have a small apartment patio space in dire need of a place you can relax with friends for casual dining, such as a lovely weekend brunch or perhaps a few drinks at the end of the week? Look to one of our new Raw Concrete Café sized Dining Tables, add four of the Tokio Teak Dining Chairs and voila! A modern, comfortable, stylish setting right outside! We are proud to introduce the Tokio Teak Dining Chair into the Teak Warehouse family, and even prouder to be able to supply it to you at wholesale prices! 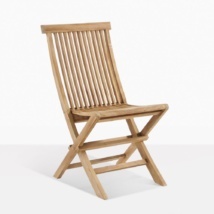 If you are waiting for the perfect addition to your contemporary outdoor dining set; then the Tokio Teak Dining Chair is right for you!